It’s Superbowl Sunday which means it’s time for some super snacks. Popcorn has been my favourite snack for pretty much my whole life. And I’m always looking for ways to kick it up a notch. What better way than adding a maple bacon twist? 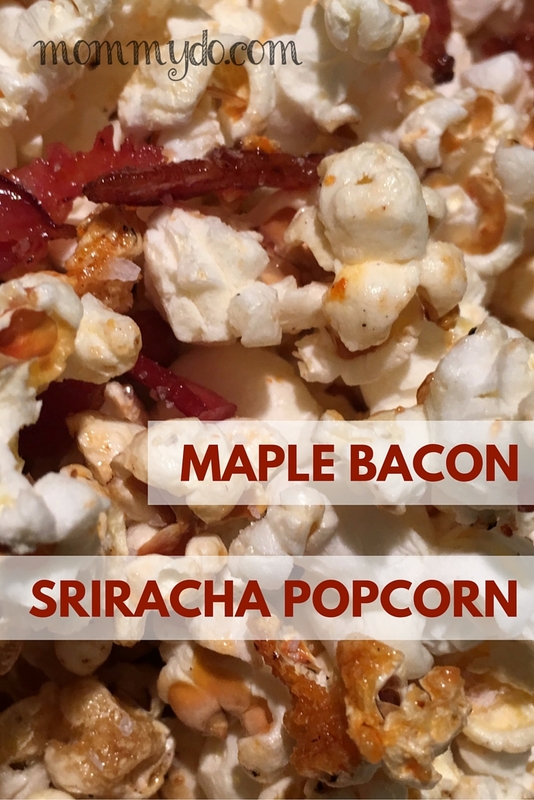 I brought the sweet, spicy and salty together in this easy, yummy, maple bacon filled, forget-about-your-diet take on popcorn. It’s surprisingly simple to make. You need bacon, popcorn kernels, maple syrup, Sriracha sauce and a little coarse salt. This sweet, spicy and decidedly not-for-those-on-a-diet popcorn makes the perfect Superbowl snack. Fry bacon in a large pot or stovetop save dutch oven. Remove from fat when crispy, but leave the fat in the pan. Blot the bacon. Tear into small pieces. Heat the bacon fat until 1 kernel added to the pot sizzles. Add popcorn to the pot. Cover and shake over med-high heat until popcorn has slowed down. Add the bacon pieces to the popped corn. Add to the popcorn and back then cover and shake to coat. Pour into bowl and finish with coarse salt.